It's a plane! It's a train! Nope, it's a really neat t-shirt that all my boys wish they had. It's Shirts that Go, and they are a hit at our house! 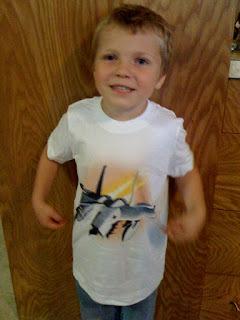 My middle son recently got to try out Shirts that Go, an innovative new clothing line of Kids T-shirts that offers highly detailed pictures of a favorite vehicle on them. Whether your kid enjoys trucks or trains, there is a shirt sure to make them smile. We loved how thick these shirts were -- totally high-quality! My son got chocolate on his the very first day, but some stain remover took it right out, and the picture of the jet is still very bright after many washings. My youngest son was a bit upset that he didn't get a t-shirt, but lucky for him, my son let him have the box that the shirt was mailed in. (You laugh.. but the box had a truck on it, and was pretty cool.) This shirt now resides in the left-hand side of my son's top drawer. This is where he puts his favorite shirts, and he is always wanting to wear it when we go places! Wanna Save? They have fire truck t-shirts, train t-shirts and airplane t-shirts all made right here in the USA. Shipping is free! Bonus for LillePUNKIN’Reviews loyal readers. Use discount code “Punkin” to get a 10% discount! *Sample was received for this review. Opinions are 100% mine.